Conductor: Have you got bones under your skin too, like me? Sometimes conductive upbringing is exhausting. Imagine what it must be like for a family to live conductively all the time. When I work in a conductive groups, the children or adults go home and I either begin the next group or I go home too and get busy with my “bits-in-between for conductors”. When I work at home with a family, as I am doing at the moment, I have a certain amount of hours when I work then I get some time for myself, not much time, but it is mine to do a few bits-in-between in. At the end of the day I am exhausted! If families live conductively they don’t go home when their eight-hour stint is up, or hand over to someone else, it is a twenty-four-hour life and much more exhausting than the work I do. One of the best things about working at home with a family is that we have ample opportunity to talk. This week we discussed the experiences that the whole family has had of conductive groups in a centre and now, for the past two weeks, of conductive upbringing at home. They value both of these and their child has done well in both situations, but at the moment they are really thankful for the input at home. They are particularly interested to see how I suggest ways of solving a problems, and then leave the child to work it out for himself, offering him tips along the way. They say it is good to see, through watching what I do and asking questions, how they can live with their child at home, to give him as much independence as they can. The situation is also an eye-opener for me. I have been working with this child for six years in a group and this is only the second time that I have worked with him within his family. He is actually more independent when he works within a group, he allows a lot to be done for him at home, in fact he often demands it! One of the benefits of my being in the family is that I can alsotalk to the extended family, the Omas and Opas, Mum, Dad and siblings. I can explain to them the best ways to offer assistance, or not to offer assistance, the latter being the most difficult. Not only difficult for me to say, especially to the doting Grandparents but even more difficult for them to do. It is often hard for me to keep my hands away and let the child complete something alone, but I always manage to stick my hands in my pockets and let him get on with it. Imagine how difficult it is for an Oma to do. Here they are, however, tough with themselves and they are doing a great job. My boy, as I call him is, is in my eyes a perfect “Petö” boy! I actually believe all people, whatever their age or whatever problems they have to solve, are perfect Petö clients, but this little boy really is a delight to work with. He has so many other problems apart from his arms and legs not always doing what he wishes them to do. He is the type of child I love to work with, and a child and family for whom conductive upbringing really does allow for development of the whole personality, in all aspects of his life. And for the growth of the whole family. This boy flourishes after just a few days either in the group or at home, but here at home everyone is there to see how and try it for themselves. The whole family flourishes. My boy, who calls me his lovely English lady, is a joy to work with and so interesting. He is a typical example of the children about whom I spoke to Dr Hári in my final exam. We spoke for an hour about something that was not actually the theme of my question, but we had a very long interesting discussion on a subject which interested us both very much. At the end she gave me my top mark of the year! These children are those who ask you iwhether you are still there when they can’t see you any more,. The moment you go out of sight they believe that you have disappeared, vanished into thin air, that you do not exist anymore. although they can still hear your voice. My boy asked me where my head was yesterday when he could no longer see that part of my body! I asked him where he thought my voice was coming from if I had no head. He had the answer immediately, “It coming from Nürnberg (80 kilometres away) where your head is and you are talking very loudly. Who says ears are on the side of your face? This all depends from which angle you are looking from. We did some drawing this week. It is a struggle but bringing results, as we saw today when his drawings of people had two arms and two legs, on the left and on the right, instead of four limbs on one side of the body as was the case not very long ago. 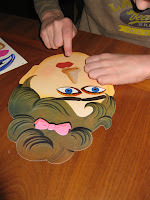 The eyes and nose, the mouth and the ears still turn up in peculiar places on the face, but that was better today with a stickers and mask game thatwe have been playing with all week. Lots of games are needed to develop both spacial awareness and awareness of where arms and legs are, in space and on the body. Where up and down and inside and outside are. Some children think that there is only half a car there when they only see the nose and the passenger doors of a toy sticking out from behind a sofa. The rest simply does not exist for them, just as my head didn’t exist when no longer in sight. We did lots of things yesterday to develop these skills. We went shopping and we baked pizza. In the supermarket there were directions to follow to find the ingredients, top shelf, bottom shelf, orange box, green box, a little bit to the left or to the right. As well as standing on tip toes, stretching arms, crouching down and steering the rolator around packed shelves and busy shoppers. Head just had to be held high. This held up the queue a bit but everyone was all smiles and I kept my hands stuck deep in my pockets. I only had to dig them out once, to catch a jar of mushrooms, as we didn’t want any dropped jars to upset the apple cart and spoil the fun. 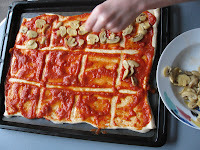 There is a picture above showing how this time while baking we drew a grid on the pizza to prevent a “pile up” of mushrooms or salami! 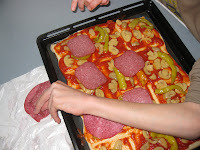 There was a tendency last time that we made pizza to make the same movement over and over again, not to move the eyes and always to look in the same place. The rest of the pizza which was out of sight got neglected and therefore didn’t get any topping. Using the grid we developed a method of placing six slices of mushroom in each square with one pepperoni and one slice of salami, all topped with a small handful of cheese. As you can see it worked wonderfully. Everyone got a bit of everything on their slice and it tasted good too. The title of the posting refers to a question that I was asked by my client yesterday. The answer took a big chunk of our time but it was worth it, Granddad overheard and was really impressed by the level of our discussion! My boy – „Hast du das auch gemerkt“ – Did you notice that too?